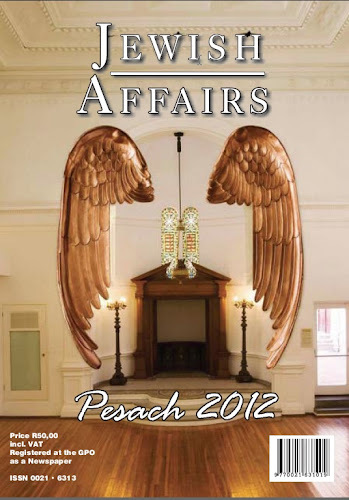 Jewish Affairs - Pesach 2012 edition devotes the cover and 9 pages to Herman Wald. Two people, very significant to the current Herman Wald project, feature in this story, Ute Ben Yosef and Natalie Knight. Reproduced below is the accompanying text to the email version of the publication by editor David Sacks. Dear Subscriber We have pleasure in attaching the electronic version of the latest issue of Jewish Affairs. For those who also subscribe to the printed version, this will be posted to you sometime during Pesach. The Pesach 2012 issue includes a special focus on South African Jewish artists. Two articles, by Ute Ben Yosef and Natalie Knight, discuss the life and work of Herman Wald, a post-war sculptor perhaps best known for his design of the Martyr’s Monument in Johannesburg’s West Park Jewish Cemetery. Wald’s work has been unjustly neglected since his death, and these essays help to redress this. Gwynne Schrire provides an insightful essay on how local Jewish artists have inverted the Crucifixion motif as an instrument of political and/or social protest while Frank Startz has contributed a profile on his late teacher and friend Sidney Goldblatt. Two stalwarts of the journal who have recently passed away are Harold Rudolph and Annette Dubowsky. A former Mayor of Johannesburg and chairman of the SAJBD Transvaal Council, Mr Rudolph also served for many years on the editorial board of Jewish Affairs. Mrs Dubowsky’s witty and lively vignettes on aspects of South African Jewish life in the first half of the last century have been featured in the last few issues of the journal, including the present one. Book reviews discuss recent works on the Ochberg Orphans, the memoir of Jewish Anti-apartheid veteran Norman Levy and a general analysis of post-apartheid South Africa in the new century by R W Johnson. In the Reader’s Letter section, Rabbi M M Katz elaborates on Jewish religious life and personalities in mid-20th Century Johannesburg in response to the article on the founding of Yeshiva College that appeared in the Rosh Hashanah 2011 issue. On behalf of the editorial board of Jewish Affairs, I wish you Chag Pesach Kasher v’Sameach.